close my eyes in a room like this. Whoa Nelly! 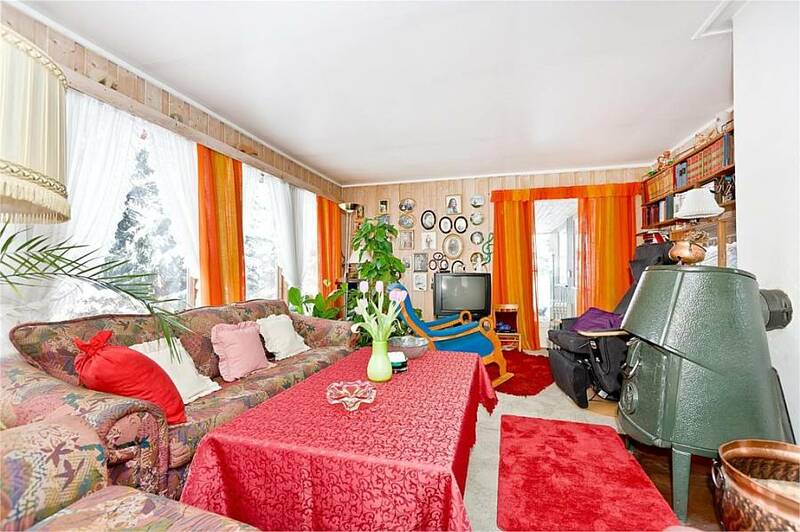 Norwegians have a peculiar sense of curtain-style. They also loooove their natural wood paneling. A really lovely home (and out of our price range). fireplace, and stairs (all very common modern design). In this blog entry, I may come across as a spoiled American brat. What I hope to really convey is simply cultural differences of expectations and cultural norms of homes and the real estate market. Also, as warning to my father, who used to warn me, "don't be snide, Emily," I get a little snide. Or snarky. Take your pick. Our lease expires at the end of June, and at that point we will leave our lovely look-out "på toppen av Birkebeinervegen" and rejoin the common folk on the valley floor in Lillehammer. It was nice while it lasted. I take that back. It was simply lovely while it lasted. We have enjoyed a spacious, light-filled, well cared for home, with superb access to the woods and to our barnehage, and space for child and four-footed friend to romp. So, in the meantime, we've been house hunting. We have decided to buy a home for a number of reasons. First of all, it is nearly impossible to find a house to rent in Lillehammer. And frankly, we need a house. With a large dog, a kid, and a houseful of furniture that we brought from the US, a 2-bedroom apartment isn't going to work. Second of all, we plan on being here for a minimum of five years, and with that length of time, it makes sense to buy a house vs. rent. And thirdly, it's simply a matter of feeling "settled" in the community. We want to give Norway a real chance, to live life like it's for real, not like we're just squatting here for a few years. Having our own place to put down some roots will allow us to feel more committed to our experience here. 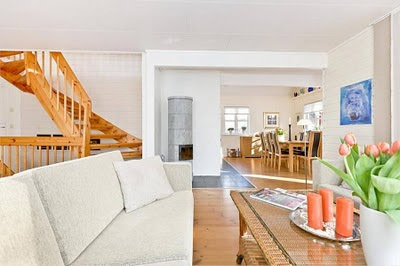 But house-hunting in Norway has not been an easy nor a very enjoyable experience. We are just coming from a different culture, with different expectations of design, layouts, use of space, etc, and it takes some adjusting. So, really, this post is not at all intended to offend my Norwegian readers. 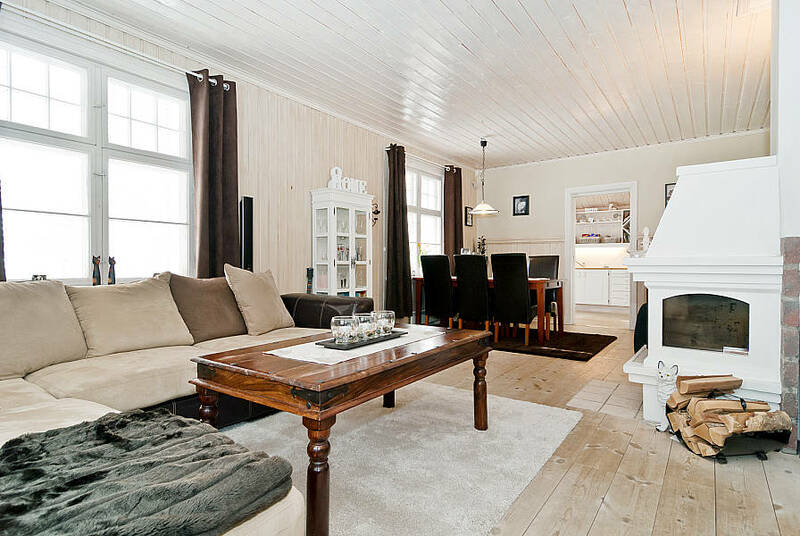 . .
Norwegians love wood, and most walls are covered in paneling, either natural wood color or more recently painted white. Often times, the paneling extends to the ceiling, and often the floors are wood, too, so some rooms simply scream "WOOD!!!" The product sheetrock does not seem to have hopped the pond, maybe because of the plethora of wood here, so walls are either the wood paneling or this textured fiber-board product, that generally indicates the home has not been updated in the last 30years. paneling painted white on ceiling and walls. Bathrooms. First off, they often lack a bathtub, and have just a standing shower. In my mind, this is not ideal with young kids. I want a tub to bathe my child in. Sometimes, the shower is simply a drain on the floor, with a curtain around it. 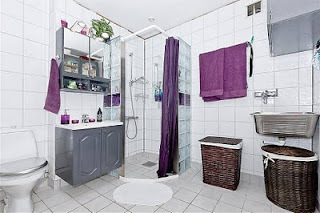 Most bathrooms are tiled from floor to ceiling, but the cupboards below the sink do not extend to the floor, but instead are anchored to the wall, and lifted off the ground by 6 inches or so, so any accumulated water might dry and drain. On a positive note, many bathrooms have heated floors, to evaporate the water off the floor (and keep your toesies warm on cold Norwegian winter nights). 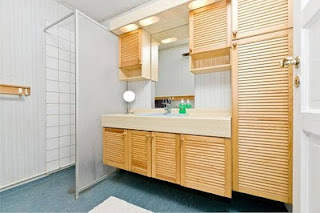 The main bathroom is often larger than American bathrooms, because they also host the laundry facilities. Living rooms: nearly always have a fireplace in it, and larger homes seem to have two or three "sitting areas", or congregations of chairs/sofas (as our current rental does). Smaller, newer homes have a combined living/dining area, that feels a little tight to us, as our 3-year old begins to take up more physical space. Kitchens: open floor plans are not very common, and kitchens seem to be closed off from the rest of the house with a door. Often a small table is squeezed in, even in the narrow galley kitchens. Refrigerators are small, sinks don't have disposals. Bedrooms: often are very narrow, barely wide enough to fit in a single European bed (which are more narrow than American single beds). Rarely do they have built in closets, so many have purchased stand up closets that are cheaply made and semi-permanently installed, often with floor to ceiling mirrors. We’re also finding many homes that have 2 bedrooms on one floor, and a 3rd on another floor. But (presuming we have a second child), who wants to sleep on an entirely different floor than your young children? handy, but definitely not an American aesthetic). bathroom is bad). 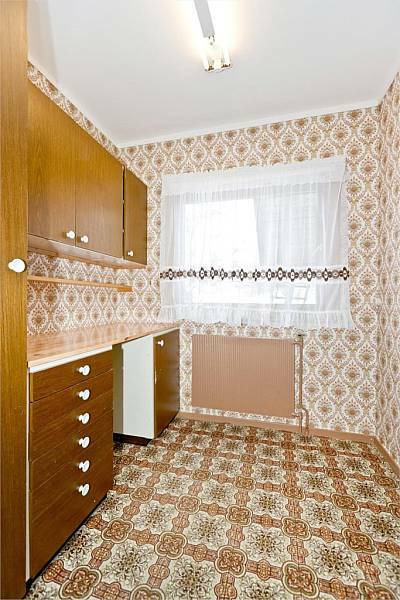 Notice the tiled walls, and raised cupboards. This bathroom also hosts the laundry (also not uncommon). enough to slide in your slippery purple bed. as possible, to show how really big it is!" PS: I apologize for, and am embarrassed of, the layout of this blog with many pictures. I am not at all satisfied with Blogger and the ability to arrange and add pictures to a blog, and will shortly changing hosts for the blog for this very reason! I'll keep you posted. . . .
Hehe, men det hjelper kanskje lite på møtet med husmarkedet i Lillehammer-området. Forøvrig, som et barn av 90-tallet, så _hater_ jeg umalt furupanel. Blærk! Hi! 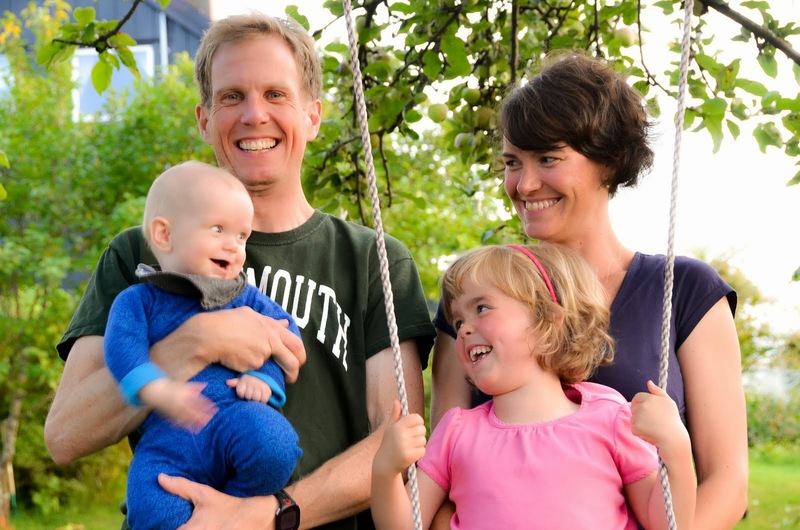 We (family of 4 from America living in Bergen) just went through this process last summer and it looks like houses are pretty much the same here. So I had to laugh - because we certainly did when we saw places with, say, the bathtub un-installed and standing in the sports shed outside ... and one house that took the pre-"visning" photos with the beds unmade and dirty laundry around! (but then again, unlike in the U.S., it's a seller's market in Norway!) Good luck! 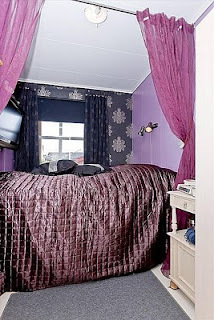 I don't think I could enter that bedroom/study withOUT closing my eyes. :-) I'm horrible at decorating but even I can see that's a mistake. 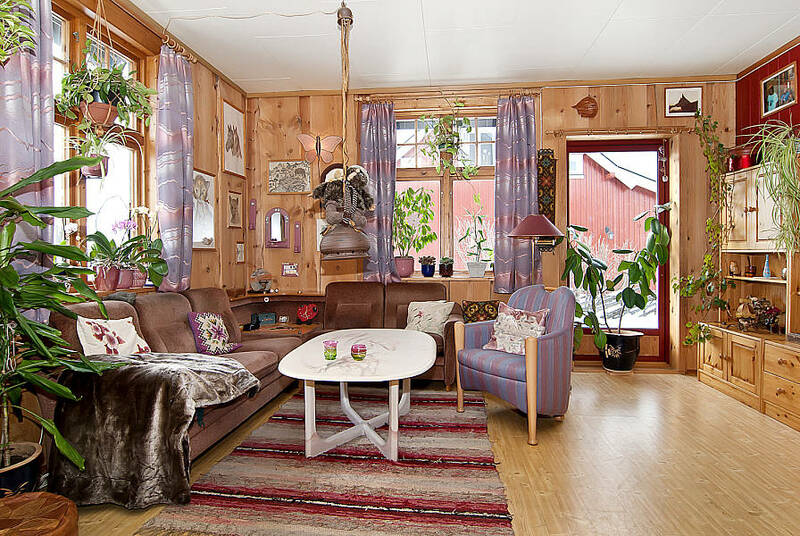 Yes, some Norwegian houses certainly have a distinct, um, style, don't they? Do be fair, when we were househunting in San Francisco in the early 90s, we saw our fair share of "design" doozies! Toilets stuck into tiny spaces under stairs and called a half-bath. Walk-in closets labeled bedrooms. And many houses that hadn't seen a lick of repair in 25 years but with asking prices that would make you faint. I agree with Michelle that I would have to close my eyes in that first picture (which of course is in the house you bought). 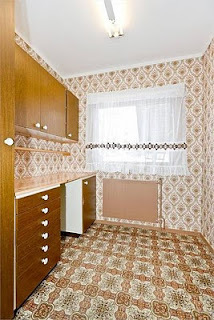 The wallpaper and floor makes me dizzy. Norwegian bathrooms seemed the most odd to me. Many of the "showers" (ie corner of the room with the showerhead and drain somewhere nearby) don't have shower curtains, so the water goes everywhere. And then you have to squeegee the water the you sprayed everywhere towards the drain. You found a great place, and once that crazy wallpaer and flooring is gone, it will be perfect. You'll need to start another blog, just about the work you're going to do on the house. Hei, found your blog from Lise's. I live in Oslo with my Norwegian guy. We're also looking at houses something (we want to buy in a year, so we're just checking). And I so understand you! 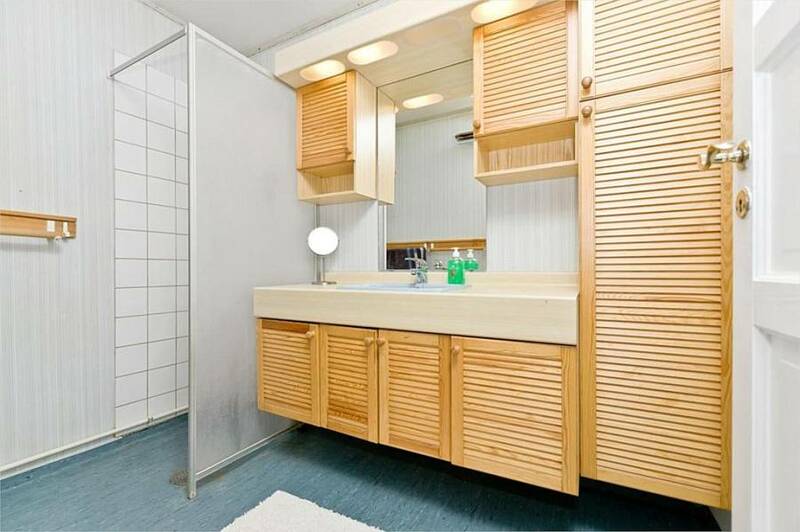 That cabinet in the bathroom drives me nuts. For me its just another wasted space. I know I’m a little bit late to the party; I’m glad that you decided to buy a house of your own. It’s been years since you posted this, any updates on your house hunt? Reading your blogs takes me back to the time when my family and I were house shopping. We had experience tons of rejection, frustration, and delays. But in the end, we were able to get the house that we wanted. I hope that your hunt ends in a happy note.